Beading Arts: Surprise package #6 from Cherry Tree Beads! 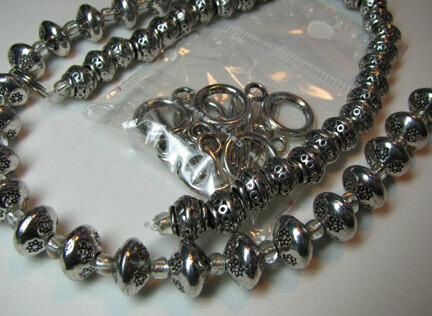 This is the last fabulous giveaway package from Cherry Tree Beads! Bill and BeBe Edwards, the owners, sent me so many wonderful beads to share with you that we have decided to give them away in smaller lots, so here comes the final one, package #6! Would you like to win them? Just leave me a comment below and you'll automatically be entered to win. If you tweet or post on Facebook or other social spots about the contest, you can leave a second comment and be entered twice! Please make sure that your link will lead me to an email address, or else I won't be able to contact you. No contact, no win, and I simply have to go on to the next person. Deadline: May 31, 2011. Great give away! I love winning stuff! Thanks for the chance to win! I would love a chance to win these beads. Such great packages they sent you. Ohhh... please enter me. Just like everyone else: I could really use those. I wouldn't mind to add them to my stash. WOW.... these are awesome! They sent you such amazing stuff! Thanks and I will send out some tweets! OHHHH !!!!! This is very nice !!!!! Can I play ????? Beautiful beads to add to my stash. Thanks for counting me in. Oh,these are so beautiful! Thanks for the giveaway, to you and Cherry Tree! What a nice stash of beads. Would love to win me some. Thank you! Would love to win, great stuff. What lovely beads! And such a cool site for beaders. I have been making jewelry since I was 17 years old (50 years), and am so pleased to see that there are millions of us who are bead-addicts. Thanks for the opportunity to win more beads!!! Oooh! These are beautiful, I would love to win. My email address is cnikita2 at aol dot com. Great Prizes. I would make these into bracelets for charity. Sign me up to win! I need new beads!